This entry was posted in Life and tagged Celebration of Life, Family, Funerals, life. Bookmark the permalink. My first meeting with Death was in 1955 when my grandmother Rosina Quesnel died. The casket was in the living room. I was 6 years-old. I couldn’t begin to imagine a 6 year old faced with an open casket. My family was/is a cremation/post service gathering clan. As I get older (and in no small part due to the number of others families funerals I’ve presided over) I find it easier to approach the passing of a loved one. Every so often I’m caught off guard, unprepared for tender words that inexplicably dissolve professional resolve. Writing Our Ancestors is a way to bring her back. Very true. You can go to the funeral of a perfect stranger and cry at the sad parting. I can only think that our tearful empathy is a deep reflection of our own impending passing, as well of those we love or loved. Not unlike weddings when we remember not just the vows we made but the deep belief and knowledge that it would all be great. A hopeful feeling. But, notes, it never occurred to me that professionals of such occasions would share the emotions. That’s actually quite heart warming. 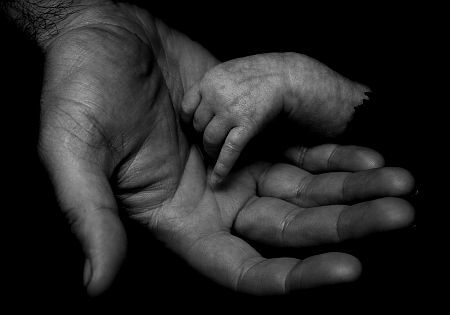 “I loved my father’s hands, he had beautiful hands. His hands held everything he cared for, his hands held hammers, rope, pen – and his hands held me”. I can’t tell you how much your “re-blog” meant to me – thank you. When Mother died, I thank one of the people that helped during the Celebration of Life and wondered how they fell during the occassion. Somehow, your Notes to Ponder have answered that question. Thank you. I’m touched by the post on hands. When it comes to photographing a dead person, it’s the hand that focus on. Your comment arrived as a seasonal gift, an invitation to revisit a post I’d forgotten about. Thank you. I’ve always been fascinated by memories.My blog was a mothers day gift from my daughter, (she gave me a slip of paper with address and password, saying “this will be good for you”) I hadn’t written in 30 years. Over 1,000 posts later, I’m fondest of those seeded in recollections. I know linking to personal blog content is poor form.That said, temptation calls for bad manners. Two posts – not well written but dear to my heart for what they convey.If inclined take a peek, I think you’d like them.